Yang Yunzhong, born in 1962 in the province of Shanxi, has worked as a medical doctor for 10 years, before he chose the path of Taijiquan and Qigong. On his way, he met many well-known masters, among them Pang Ming (Hunyuangong/Zhineng Qigong), Feng Zhiqiang (Chen-Style Hunyuan Taijiquan), Ti Enfang (Cheng-Style Baguazhang), Wei Shuren (Yang-Style internal Taijiquan) and Wang Zhuanghong (Water-Style Taijiquan), who named him as his successor. In 2009 Yang Yunzhong founded the »Institute of Chinese Taiji-wisdom« and developed his own style further as Rushi Taijiquan. The encounter with Wang Zhuanghong inspired him to connect his Taijiquan with the essence of Chinese religions and philosophies and to understand this precious heritage of China as comprehensive cultural work. 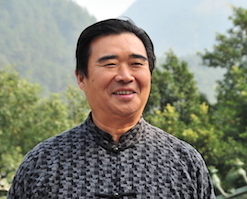 Inspired by his master, Yang Yunzhong wrote four books about Taijiquan which all bear »Xin« – the heart – in the title: The Transmission, The Enlightenment, The Language and The Conclusion of the Taiji-Heart. 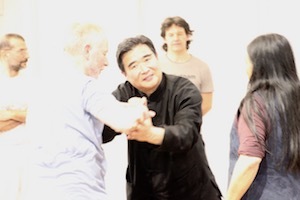 With »Taiji Ba Fa« – the eight basic forms – and the Taiji stick he wants to create a basis for Taiji practitioners. The special focus of his teaching lies on the connection between the external of the physical and the internal of the energetics. Water is a central element of energetic movement. In the mornings, I would like to share some basic Qigong energy exercises stemming from the 13 original postures of Taiji. In the afternoons, we will work on Water Taiji. We will experience both its aspect of individual self-healing as well as its practical application in partnerwork. 3 animal routines from „Taiji shisan Dan Fa“, the ancient Taiji 13 Form in a variant working with animals. The 13 original energy exercises of Taiji are the 13 postures, out of which today’s Taijiquan forms are thought to have evolved.